It seems as though winter has finally given up here in NW Ohio. With the lengthening of days and fields of dandelion's in full bloom, spring has definitely arrived. As I posted earlier, my daughter and I are still planning our Appalachian Trail (AT) hike. And so like every good father should, I am practicing and planning for every situation. Fortunately, the weather has helped. I have been wanting to practice fire starting in wet and rainy condition, and we have received over an inch of rain in the last 3 days. Thankfully this rain has been in the form of a long, regular mist with periodic sprinkles of rain. So this has provided the perfect starting weather for my work. To be honest, I'm still struggling. I have tried a few things with limited success, but I am getting better. One of the things I have learned is that my serrated knife throws great sparks with a ferris rod. (No, I don't use, or like, the serrated edge so I do not care about dulling it). Sparks are easy, a sustaining fire is not. Hopefully I will get this figured out. The work will be worth it to know we will be able to have a cooking fire no matter where we are on the trail or the weather condition. If you have any hints or tricks, leave them in the comments, I would love to hear them. So after some hasty thought, my youngest daughter and I have decided to undertake a joint getaway. It looks like next year we will be taking a week to hike part of the Appalachian Trail. Honestly, this is a snap shot of the bigger dream. I have desired to do the entire trail since I learned about it some 25 years ago. But who has 6 months free to go on a hiking trip? Certainly not I! So I never got around to doing any of it. So it is with great joy and excitement that my daughter has chosen to join me in this endeavor. It's even more cool to see that she is just as excited as I am about this trip. Granted it will only be 1 week, sure we will only get about 100 miles, but it's a start. And you never know what may come of it. Maybe someday, I'll have a 6 month sabbatical in which I can leave on an amazing 2,000 plus mile journey. Well, my family just returned from a short camping trip. We enjoyed a Friday / Saturday with some good friends who have a permanent camp site. We have another camping trip scheduled in a couple weeks with some other friends. I'm hoping this will be just as fun. There is always a small part of me that is nervous about camping in a campgrounds. When I am in close proximity to others, it seems my family is always next to the guy who can snore loud enough to shake our pop-up! I hate it when it happens, and even earplugs can't completely silence the sounds of the snorer!!! On April 19, 2013 I had a board meeting at one of my favorite places in all the world. Camp Otyokwah. (yes, I am on the board of trustees) So in order to be on time for the early meeting (I live 3 hours away), I chose to go primitive and spend the day before in the woods. 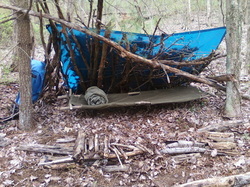 The picture on the left is the beginning of my shelter and body fire in front. I completed my lean-to and retrieved more wood for the evening and then settled in for a nice evening. It was a little chilly, but I admit I never checked the forecast. About 2 or 3 in the morning I was awaken to the sounds of rain hitting my lean-to. That didn't bother me because I knew, with the tarp, it would be water proof. However, when I looked out (without my glasses on), it didn't look like rain. I reached out and put my hand in a pile of snow! It continued to snow the rest of the night and in the morning there was a dusting everywhere. Thankfully, I had a fire and plenty of wood. I stayed toasty warm. I was also glad I stayed about 100 feet out of the valley so I didn't have the brunt of the cold. All in all, it was a good night and a beautiful morning with the fresh snow laying around. My only regret, I didn't bring items for breakfast. I didn't plan on eating here anyways, but after waking up to the beautiful scene, it would have been the ideal place for a cup of "fire-brewed" coffee and some scrambled eggs. Oh well, there is always next time.